Earlier this week, ‘wichcraft launched their summer menu, bringing back some of last year’s goodies, while still introducing new combinations. The flank steak ($9.87) and the zucchini and mozzarella ($7.35) sandwiches were great last summer, but I was interested in checking out something new from ‘wichcraft. They were sold out in Bryant Park on my first attempt to get the chickpea hummus sandwich ($7.35), which I suppose was a good sign. When I finally got my hands on one, I wasn’t really sold on my first bite, but the more I ate, the more I enjoyed this light sandwich. It was herby and bright in flavor. The multigrain bread was actually on the dense side, making this not as flimsy a sandwich as I expected. It could be a really nice option for meatless Monday, if you’re into that sort of thing. I wasn’t so impressed with last summer’s frittata sandwich, but for some reason, this year’s spoke to me. It was very similar, with peas and other green veggies, topped with aged cheddar ($6.89). 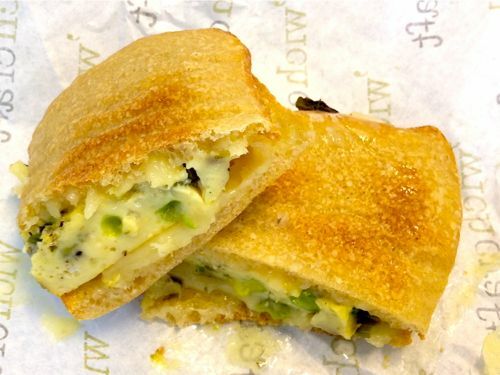 But the ciabatta was much better, as was the bread-to-filling ratio, and it was well-seasoned. I’m a sucker for breakfast for lunch, so I would get this again. 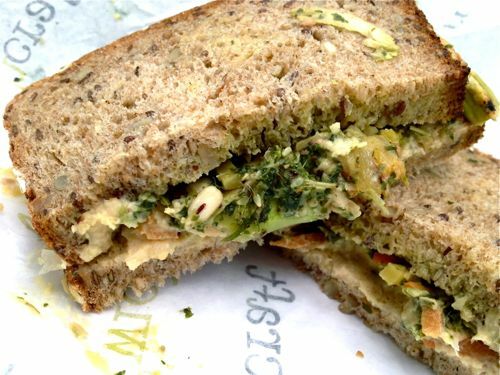 The other sandwiches include a chicken salad (with kale, cucumber, walnuts and pickled red onions) also on multigrain bread. At $9.64, it’s a lot for what it is. I think Midtown Lunch’ers would rather spend that kind of money on slow roasted Berkshire pork on a ciabatta roll with red cabbage, jalapeños and dijon mustard ($9.19). Of course, Tom Colicchio’s special mortadella sandwich remains on the menu. Me? I’m returning for the flank steak — I just hope it is as good as I remember. 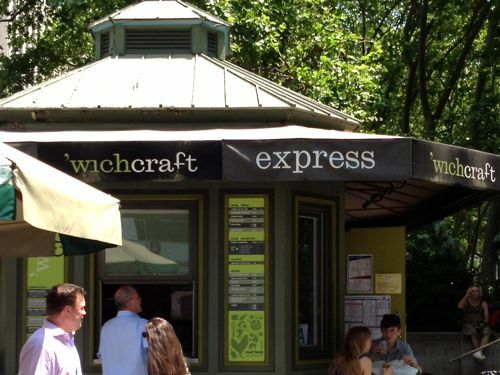 Posted by Rachel Goldner at 11:30 am, June 28th, 2013 under 'wichcraft.